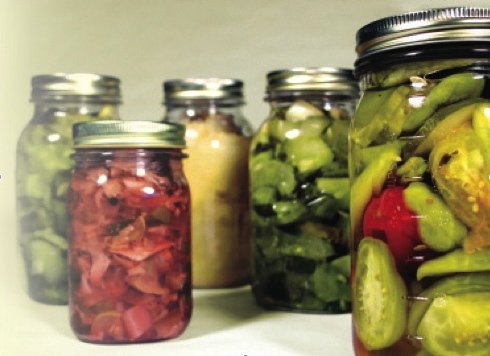 Maybe you’re one of the lucky ones who’s never forgotten the fun of canning and pickling the bounty from your garden. Or you’re one of the many new people joining in this time-tested way to enjoy your crops all year long. A symbol of both thrift and abundance, the pickle jar is a staple in every well-stocked pantry. If growing your own pickles doesn’t strike your fancy, you’re still a pickler if you enjoy mixing up that lively relish recipe or gourmet side dish of spicy pickled mango. Using an array of spices and a variety of produce (think outside the cucumber patch), you can easily make your own signature pickles. If you’re going to make pickles, good spices are essential to good pickling. If you have fresh spices in the garden, like stalks of graceful dill, include those for visual interest and fresh taste. But dried spices — whole, ground, and crushed — are really all you need. For ease and dependability, you might want to keep a ready-made pickling blend on hand. You can have some fun concocting your own custom spice combinations, too. One person’s favorite pickles might highlight the warm sweetness of cardamom and allspice, for example, while another cook’s favorite blend might pop with chili peppers and garlic. Here’s our favorite blend to get you on your way. This is where the bulk section can really be your friend – buy a pinch or buy a pound of these ingredients, depending on the size of your project. Use this recipe as a rough guideline, and vary amounts and spice choices according to taste. Simply combine all ingredients to make about 1/4 cup of blend. Make small batches of several blends and use your assortment on pickling day. Use soft water, or distilled or bottled water. Hard water interferes with the curing process. Use vinegars—cider, white, or others—with 4 to 6 percent acetic acid. Commercial vinegars meet this requirement, and you can buy a ph meter to test homemade vinegars. Use pickling salt—not table salt that contains iodine or anti-caking agents or sea salt, which contains trace minerals. Pickling salt (and kosher salt) is free of additives that might discolor ingredients. Use pots, pans, and bowls that are unchipped enamel, stainless, or glass. Galvanized, copper, brass, or iron pans or utensils can react with the salts or acids and change the color and taste of the pickles or even form toxic compounds. Please visit our Facebook page and post a photo of your pickle or canning project – we’ll randomly choose one of you to win a great batch of canning accessories and spices! This entry was posted in At the source, In the kitchen, Natural health and tagged canning, cinnamon, cooking, garlic, natural living, nutrition, pickles, recipes, spices by Cayenne Room. Bookmark the permalink.